In the later 19th century, Qajar artists began to imitate the art of the Safavid period. In ceramics, Qajar potters, such as Ali Muhammad Isfahani, copied the colourful, monumental seventeenth-century tile panels that decorated palaces in Isfahan. 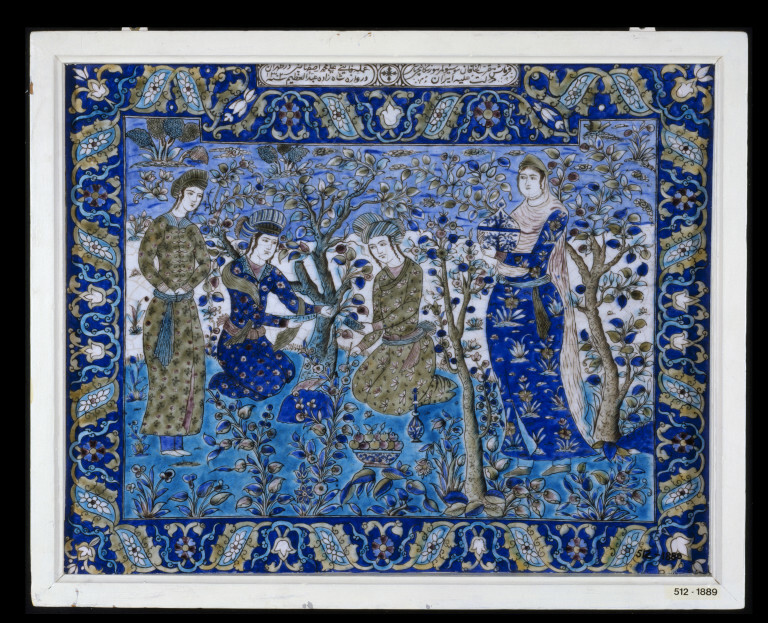 Many of these included elegant courtiers drinking wine in lush gardens (see for example V&A 139-1891), as here, scenes also found in Isfahan miniatures. This single tile reproduces one of these multi-tiled picnic scenes. The composition is centered on a pair of figures, a young man in seventeenth-century style costume wearing a European hat and cloak, and a young woman reclining in an elaborate robe and scarf. This tile was commissioned around 1884-5, by a French composer of military music, Alfred Lemaire (1842-1907). From 1868, he was working at Tehran's Dar al Funun (Abode of Sciences), a technical college, training the staff to teach music; he later composed Iran's first national anthem. It was part of a set, including a fireplace surround, completed for him in the same year (see 510, 511, 512 & 522-1889). By 1889, they were displayed in Paris, at the Exposition Universelle, when owned by the French photographer Jules Richard (1816-1891), who had also worked at the college; he was the first foreign photographer to serve at the Iranian court. Fritware is a mixture of finely ground white flint stone and white clay. It is molded into flat panels and painted in colours based on minerals and metals, such as blue from cobalt, purple from manganese, black from chromium, yellow from iron or antimony, turquoise and green from copper, when dried it is covered with a transparent colourless alkaline glaze. Many of the colours run into the glaze during firing, so the outlines are drawn in black for sharper designs. Rectangular tile, fritware, painted under the glaze in the following mineral pigments: cobalt blue, turquoise, green, yellow, purple and black. 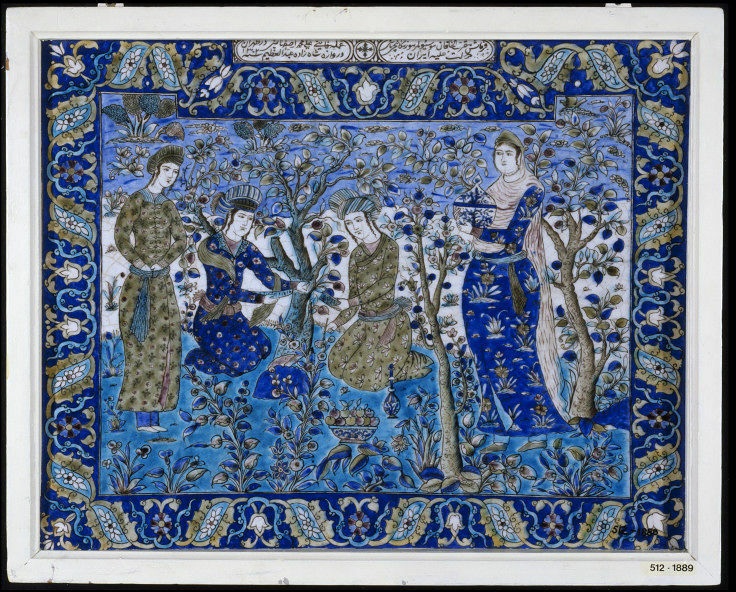 The narrative scene depicts young men reading poetry in an orchard, accompanied by male and female attendants. The scene is framed with a boder of saz leaves, flowers, stylized lotus and cloud ribbons, incorporating two inscription cartouches. Wood frame painted white. 'The order of the confidante of his Imperial Majesty, Monsieur Le Maire, Chief Musicmaster of the Government of Iran in 1302 '. 'In the capital of Tehran the work of the master Ali Muhammad tilemaker of Isfahan Workshop, gate of Shahzadeh Abdul Azim'. Persian inscription in two tri-lobed cartouches centred in upper border written in nast 'aliq script in black. Purchased by Major-General Sir Robert Murdoch Smith KCMG from the collection of Jules Richard, displayed at the Exposition Universelle, held in Paris, 5 May - 31 October 1889. 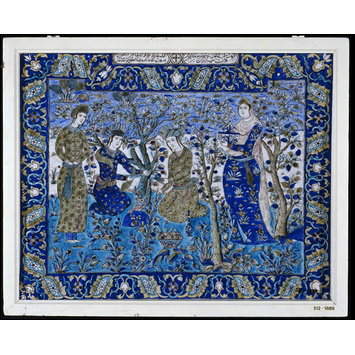 Tile panel, fritware, underglaze painted in polychrome with a picnic scene, inscribed with the name of the painter, Ali Muhammad Isfahani, his patron, Albert Lemaire, and the date and place of manufacture: Tehran, Iran, 1884-85. Jennifer M. Scarce, 'Ali Mohammed Isfahani, Tilemaker of Tehran', Oriental Art N.S. 22 (Autumn 1976), 278-88 (table 1, no. 2). Arthur Lane, Later Islamic Pottery, London, 1957, p. 86. and pl. 63. In the later 19th century, Qajar artists began to imitate the work of the Safavid period. One was the potter Ali Muhammad Isfahani, whose tile shows a picnic scene (2). The other, anonymous tile also depicts a group of people wearing late Safavid costume. In the background are the Armenian churches of Isfahan.